It takes 30 years to figure out there’s a problem? I’d suggest thee code enforcer has a prior issue with that business we aren’t hearing about. And who ever gets thrown in jail for a code violation? The 1965 Voting Rights Act was created to combat the systematic disenfranchisement of minorities, especially in Southern states with a history of discrimination. But the Justice position is a lead zeppelin, contradicting both the Supreme Court and the Department’s own precedent. In 2005, Justice approved a Georgia law with the same provisions and protections of the one Mr. Holder nixed for South Carolina. In 2008, the Supreme Court ruled 6-3 in Crawford v. Marion County Election Board that an Indiana law requiring photo ID did not present an undue burden on voters. But betting man? Holder? I’m surprised has hasn’t folded his hand. He really should. Read the whole article as Hot Air’s Ed Morrissey points out that the photo-id established by Indiana and others are provided to the applicant for free. At least, it would seem so. Here’s an open letter to the AG from an ATF Agent. In Mexico. Wonder if it will make a difference. Nah. If his boss won’t hold his feet to the fire, there’s only one way to take care of the problem. Elect someone else as President of the United States and – hopefully – most of BO’s administration gets replaced. Eric Holder first. Oh, and then there’s this – apparently, Eric doesn’t think a photo ID is needed to vote. You know, we wouldn’t want any unnecessary burdens on anyone that doesn’t have a drivers license, or has to prove their identity when seeking a job, or credit, or cashing a check, or buying liquor. 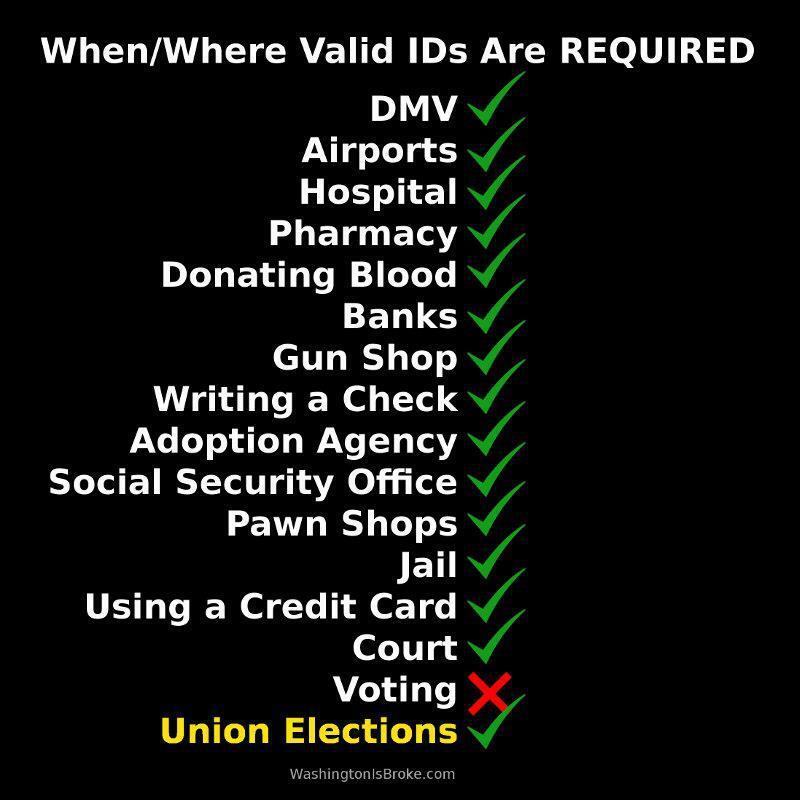 One would think that voting wasn’t as important as, you know, preventing fraud of any kind now is there? UPDATEx2: From FB. This picture was recently updated to include an additional line item at the bottom of the list. …the big spike in arms supply to cartels didn’t come from local gun shops at all, but from the US government approving a rapid increase in direct sales from manufacturers to the Mexican government, whose purchases got diverted to the cartels — a fact known to the Obama administration all along. A violation of any of the IEEPA sanctioning programs or the Kingpin Act carries stiff penalties, both criminal and civil, and potentially totaling decades in prison and tens of millions of dollars in fines. It is not necessary that an individual or governmental entity be shown to have “knowingly” violated any of these programs: it is illegal for any U.S. entity or individual to aid, abet, or materially assist — or in the case of Operation Fast and Furious, to facilitate others to aid, abet, or materially assist — designated drug traffickers. There are no exceptions within IEEPA programs for unlicensed U.S. law enforcement or intelligence agency operations. The only way the DOJ could remain legal invovling this Kingpin Act, would be if Attorney General Eric Holder requested a waiver before activating the program. Hhhhmmm. So, if there is no waiver, either he didn’t know (and ignorance of the Law is not an excuse in Court) or he knew and has perjured himself (and if this is true, find the waiver). Either way, he’s in deep doo-doo, I’d say. This time it is Utah. Two days before Thanksgiving. WASHINGTON – The Department of Justice today challenged Utah’s immigration law, which comes after recent lawsuits in Arizona, Alabama and South Carolina. How, selfish, of them. Telling states they are not allowed to protect themselves, their lawful residents, their budgets and their way of life. Is it the Feds job, Eric? Then why don’t you do it?? By the way, Eric, where is the money coming from to support all these lawsuits? Just how many states are you willing to sue? Do you really expect the states to respect you for this? No soup for you, Eric. What happens when an animal is cornered? He strikes back. Is that what is happening here? President Obama’s top law enforcement official has embraced a new strategy, actively confronting and rebuffing the serious concerns and disparaging remarks emanating from Capitol Hill while admitting mistakes made by his department, promising to hold officials accountable, and vehemently seeking to tell his side of the story. Not that I feel optimistic or wanting to give him the benefit of the doubt, but there have been numerous other problems – in addition to Fast & Furious – where the DOJ has failed and/or ignored their duties to uphold the Law. Such as Article 4 Section 4 of the Constitution and suing Arizona for attempting to defend itself and its citizens (do you know DOJ is suing a number of other states for attempting the same? ), charges of voter intimidation, to name but a couple. Not to mention the fact, according to Judicial Watch, of totally ignoring subpoenas with regard to Freedom of Information Act requests for documentation. No, he’s fighting for his pathetic job performance, in my view.